Told by the woman who is only known as “the wife,” Dept. of Speculation is a profoundly sad look at a marriage dissected with all its blood and gore and visceral beauty laid out in perfectly placed lines of prose. Ms. Jenny Offill owns the word poignancy with her second novel. The book may be tiny, but it’s marvelously huge in insight and honesty. Rich with humor, and deep with despair, Dept. of Speculation paints a masterful portrait of the nuts and the bolts and the warts and the silky splendor that defines commitment—the commitment to live in close quarters with other humans. What woman doesn’t feel undeserved and afraid when given such a task as motherhood? The story is not so much about the characters as it is about what makes us human. Written primarily with internal musings, Dept. of Speculation constructs only a loose image of the wife and the child and the husband, while artfully creating a tightly weaved tapestry about what keeps them together and what threatens to shred them apart. Although perhaps not the best choice for the recently engaged, Dept. 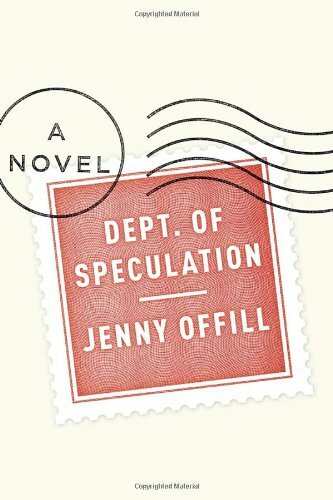 of Speculation is a quick, beautiful read that will draw out joy just as quickly as sadness, and may even cause one to pause and then wonder, and then to finally embrace both the misery and the magic of marriage.